Shundrallah: Occupy Corporatism! 100% Original, Transparency, Honesty & Integrity. Occupy Corporatism! 100% Original, Transparency, Honesty & Integrity. I had seen there Site and information for a while, and because of their association with alex jones i basically ignored them originally..
During this time i was receiving communications from pete that exposed his Deception, telling his listeners one thing "claiming he had nothing to do with before its news" then in email telling me his setting up their video stream Chanel... "This has all been exposed along with pete santilli making death threats to 4 people, and deliberate lies about many people, read about it all i made everything transparent in other articles including all emails, so everyone knows the kind of Psychopath Pete Santilli is..."
The Truth is Morally i will defend anyone, morally people will defend them selves from pete santilli, and morally i can not defend pete santilli, so when the other sharks come to pete with Extra Rope for the 1381 History Repeating its self, hanging of the Immoral Bloodline and their Minions, NO ONE WILL MORALLY STOP THEM, i will personally watch pete santilli hang... i think other people have a far more moral claim to put the rope around his neck, morally i wont be forced to defend him as it will be the ones hanging him in the moral defense of petes immoral attacks and deliberate immoral deception that will be the reckoning coming... Pete is protected now by the System, Government who pays and employs him, the Boat will only protect you so long pete, a Storms coming and the systems going to be kicked out, your boat will capsize and you will join us in the ocean unprotected by your masters, the sharks will rip you apart... and pete santilli is TERRIFIED because he knows his facing Oblivion "his final Life-Force End" because of his Immoral CHOICES AND ACTIONS! Because of the Choices and more importantly ACTIONS of Susane Posel, its not just me, its almost the Entire Independent Truth Movement Community has Embraced Occupy Corporatism, as a Reliable alternate Source of Information... "Having More Readers and Listeners now then ever before"
I have spoken to Susanne Posel and Dave Posel "many times previously, however recently i have received some important Clarifications"
I have NEVER been associated with OWS. The last time I was in NY I was 4 years old visiting family. Pete is a lot dirtier than you have figured out. I have REAL dirt on him. I have left his show. I had previously linked a Video Readers brought to my attention about the OWS "Occupy Wallstreet" protests Co-Opting and asked if Susane Posel was involved... "above you can read she is not involved"
"Officially From Shundrallah , John McAlpine would like to apologize for any flack caused from linking that Video in Association with Occupy Corporatism and Susane Posel, i have No Evidence or Facts to Doubt Susane Posels word, and from her above reply on the matter i must make the correction for all readers"
Officially Shundrallah is Not Payed, has never been payed "From anyone for that matter"
nor have i received any donations "From anyone again for that matter"
I spent many hours one evening talking to Dave Posel about Eastern Philosophy, He is a Very Wise and Experienced being who in my opinion is one of the few i have ever encountered to really KNOW the RTA! For this Reason, and the Fact that Susane & Dave Posel have only ever acted Morally! And until i have Factual Evidence of the contrary i will continue to defend all moral people who have integrity... "Especially those Active and Acting in the Truth Movement Area!" Hone Harawira "Dragon seen in Action!" 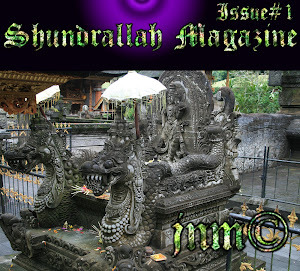 Shundrallah Magazine Issue #1 "Comming Soon!"